With ANZAC Day 2016 approaching I decided to create a page with a list of the Harper, Trew and Bown families who enlisted during WWI and WWII. Where available I’ve included a link to their military documents in the National Archives of Australia collection. Frances joined as a member of the veterinary division at 24 years of age. He spent almost 3 years in various locations in Egypt and France and was, for a time, detached from his unit (4th Mobile Veterinary Section) for duty with the 4th Division Artillery. 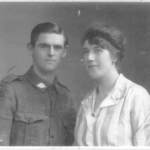 HARPER Joseph Patrick : Service Number – 1299 : Place of Birth – Riddell VIC : Place of Enlistment – Melbourne VIC : Next of Kin – (Wife) HARPER Mabel Rose. Joseph joined at 35 years of age and was assigned to the Army Veterinary Corp. He spent around 2 years in Egypt at Moascar, Abbassia and Boulac and contracted Malaria during his time abroad. HARPER Wilfred Ernest : Service Number – 679 : Place of Birth – Riddle’s Creek VIC : Place of Enlistment – Adelaide SA : Next of Kin – (Wife) HARPER May. Wilfred joined the 3rd Squadron 1st Remount Unit. He used a false name (his real name was William James Harper) stated his age as 46 though he was actually 40 at the time. He contracted mumps around 4 months into his 7 months in Egypt and, after spending time at Cairo Auxiliary Hospital, was returned home in 1916 when his unit was disbanded. KIA – HARPER Christopher Ernest : Service Number – 1658/4509 : Place of Birth – Riddells Creek VIC : Place of Enlistment – Melbourne VIC : Next of Kin – (Mother) HARPER Honora Mrs.
Christopher’s name is included on the Villers-Bretonneux war memorial. TREW Samuel : Service Number – 4011 : Place of Birth – Warracknabeal VIC : Place of Enlistment – Broadmeadows VIC : Next of Kin – (Wife) TREW Rosina. Samuel was 29 years of age when he enlisted. After two transfers to Egypt over a period of 16 months, he was discharged on medical grounds due to a pre-existing heart condition. TREW Tom : Service Number – 1840 1550 : Place of Birth – Warracknabeal VIC : Place of Enlistment – Balmoral VIC : Next of Kin – (Wife) TREW A M.
Tom was 22 years of age when he enlisted. Just 3 months after arriving in Egypt he was admitted to hospital with shell shock. He then suffered loss of memory and fits and was returned to Australia. Edward served in both world wars.